Contracts are hard. There are so many unwritten rules about what you can- and can’t do with a contract, and they are always changing! 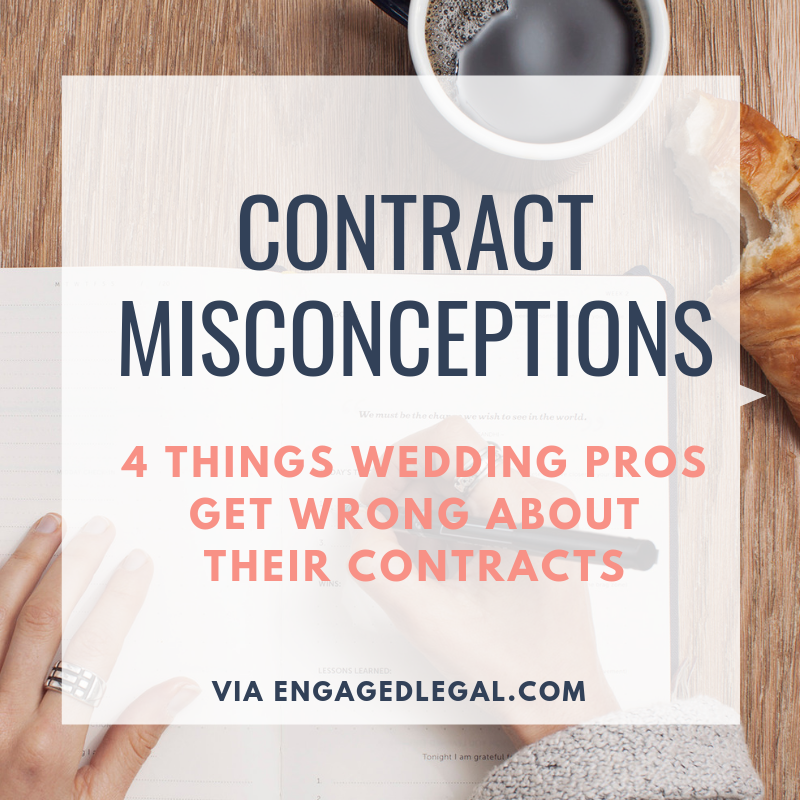 Here are the Top 4 Misconceptions or questions I’ve heard from wedding and event pros about— you guessed it— CONTRACTS! The truth is that any nonrefundable payments are reaaaaaaally scrutinized if you end up in court. Why? The legal system actually likes people to be able to get in and out of contracts as they want to— even though that sounds counter intuitive. So really, nonrefundable deposits are an uphill battle from square one. How do we get around this? We make sure a contract cancellation doesn’t look like a penalty, and instead looks like a way to compensate you for the time you’ve spent putting in work for the event, OR to compensate you for taking that day out of your availability. The term “liquidated damages” is a “magic word” here that helps set up this type of payment structure. Signing a contract and paying for something means it’s a “Work Made for Hire,” and the purchaser owns the copyright. SING IT FROM THE ROOFTOPS: Just because you pay someone for something does NOT MEAN IT IS A WORK MADE FOR HIRE. In fact, there are only a few times when a Work Made For Hire is in play, and RARELY will you encounter these in the Event industry, unless that person is an employee. Why do you care? Because if it’s not a Work Made For Hire, you don’t get the copyright unless you’re signing a separate copyright transfer agreement. Period. Example: You work with a designer to produce your logo. You sign a contract stating the logo is a Work Made for Hire. Guess what? It’s not. You technically don’t have the right to use that logo without the designer’s consent, which they can take back at any time. And yes, this means you could get “held hostage” by a designer who wants more money. HEAVY STUFF here. This is why it’s important to always always ALWAYS execute a copyright license or copyright transfer agreement. Your proposal isn’t a contract. A proposal is just that, a proposal…. right? A proposal can be considered a binding contract. In fact, it will be binding, unless you specifically state that it isn’t! So if you’re sending out proposals left and right and/ or signing proposals without getting deposits, you might want to rethink your process. One way is to disclaim that proposals are “non-binding until receipt of payment of a retainer and execution of a client service contract.” That way, you’re not getting stuck in a contract you can’t— or don’t want to— fulfill! You can prevent someone from leaving bad reviews by putting it in your contract. Good thought, but this doesn't work. “Gag clauses” for negative reviews are being held invalid all across the country as a restraint on free speech and against public policy because of their negative effects on consumers. Federal law has actually invalidated these types of clauses. And while I KNOW it’s frustrating to feel held captive by threats of bad reviews, these types of clauses aren’t going to help. It’s better to have 1) a clear contract, 2) a strategy for dealing with these types of reviews, and 3) an arsenal of good reviews from happy clients so you can handle a threat when it comes.